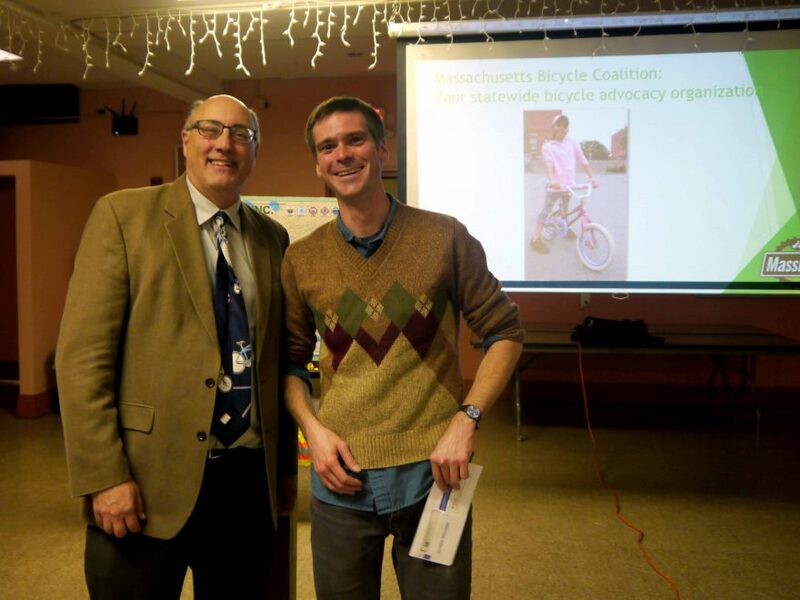 New MassBike Director Gives Presentation at Annual Meeting – Bike to the Sea, Inc.
Galen Mook, the new executive director of MassBike, was the keynote speaker at Bike to the Sea’s annual meeting on Thursday, Nov. 8. Mook, who took over as director in July, talked about ways MassBike could help Bike to the Sea with education, advocacy, and access to grants. Also speaking at the meeting were Bike to the Sea project manager Clay Larsen and Malden Arts President Naomi Brave. Larsen talked about work being done to improve the trail and extend it into Lynn. He also encouraged people to attend another round of trail design meetings being held in Malden, Everett, Revere, Saugus and Lynn this month. A mural honoring children’s book author Ed Embereley (above) is an off-shoot of the ArtLine in Malden. Brave talked about work being done to create the ArtLine in Malden and then expanding it throughout the trail in Everett, Revere, Saugus and Lynn. The project involves creating a public art gallery with miles of professional murals, sculptures and community hubs which will be green gathering spaces with art, and pedestrian and bike accommodations. Inspiration for the project comes from the High Line in New York City, the Rose Kennedy Greenway in Boston, and mural festivals in Lynn and Worcester. Work has already begun in Malden for several projects where MaldenArts is partnering with Groundwork Somerville, Mass Development, and the City of Malden. Brave said they’ve raised money for the ArtLine project through public fundraising activities and state grants.